Just hours after all of the Harry Potter books were finally made available on the Kinde, the Amazon Kindle Store is experiencing some difficulties. 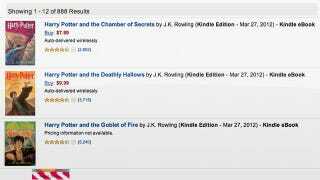 Did fanatical Harry Potter fans rushing to download ebooks cause the outage? It seems plausible. It seems that the store is slowly creeping back to life. You can now buy titles across the store, but several remain unavailable.